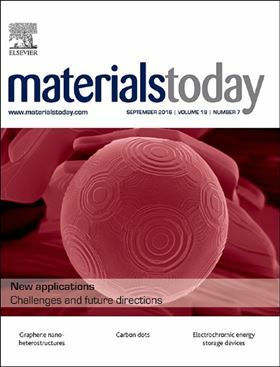 Materials Today, the flagship journal of the Materials Today family, is dedicated to covering the most innovative, cutting edge and influential work of broad interest to the materials science community. Having established the journal as one of the most highly respected sources of news and reviews in materials science over the last two decades, and recently achieving an Impact Factor* of 17.793, Materials Today is now expanding its scope to cover ground breaking original research in materials science, and aims to become a leading forum in the field. The editors now welcome comprehensive articles and short communications reporting breakthrough discoveries and major technical achievements as well as review articles from established leaders in engaging and rapidly developing fields within materials science and related disciplines. The journal expects to accept only the most significant submitted manuscripts, but will provide very rapid evaluation to prevent publication delays. For content published from 2017, the journal will become a hybrid open access and subscription title. In tandem with the revised scope, two new Editors-in-Chief have joined to lead the title: Professor Jun Lou of Rice University and Professor Gleb Yushin of Georgia Tech. Under their expert leadership, the journal will continue to offers authors rigorous peer review, rapid publication, and maximum visibility. The growing Materials Today family provides authors and readers with comprehensive coverage across materials science, spanning ground breaking discoveries to highly specialized research; and also includes such journals as Applied Materials Today, Materials Today Energy, and Materials Today Chemistry - in addition to the dedicated proceedings journal Materials Today: Proceedings, and sound science publication Materials Today Communications.